Introducing a new Tattler feature, How's Emeryville Doing? Beginning with our story on the Urban Forestry Ordinance, we're investigating Emeryville's codes, laws and planning edicts to determine how effective they are. 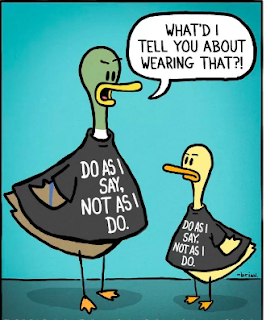 Should we keep them as they are or amend some of these guiding mandates? Or should we get rid of them? 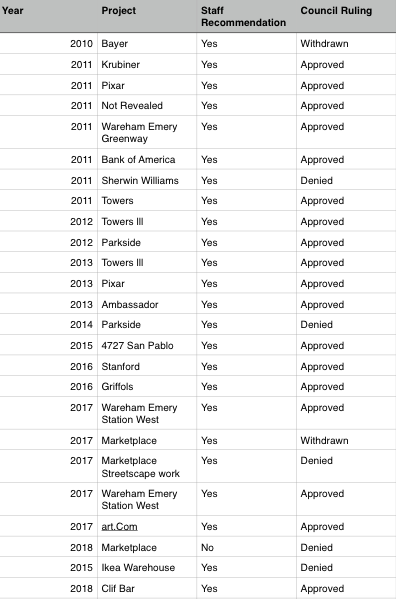 Look to How's Emeryville Doing to cut through the artifice built up by those who stand to benefit by inaction and ineffectiveness in our governing documents. Emeryville's City Hall staff recently recommended to the City Council a developer's Noise Ordinance waiver request be denied, marking the first time in the eight year history of the ordinance the staff has ruled in favor of the citizens interests over the business sector. 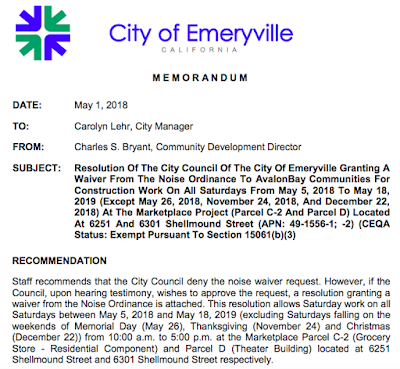 May 1st is a red letter date in Emeryville history; the date the Council, accepting a staff request, told a developer NO to a Noise Ordinance waiver request, specifically in this case the developer of the Marketplace project, who requested permission to work every Saturday over the next year. An interview with staff didn't lead to any more understanding of the extraordinary May 1st denial; they simply referred us to their Report to the Council. The report says the denial recommendation was based on the developer's insistence the City look after his bottom line by helping to speed up the work schedule. However that same reason has been offered up before by other developers seeking waivers and that has never been cited as reason enough for staff to recommend denial of a waiver request. In fact, the developer of an earlier phase of this same project asked for and received a waiver based on the same reason and the Council, by default, ruled that desires of developers to speed up their projects now qualifies as reason enough to grant waivers. All this leads us to question if reason is even at play at City Hall with regard to the Noise Ordinance or is it just capriciousness instead? Perhaps the staff finally became embarrassed by all the negative Tattler stories. 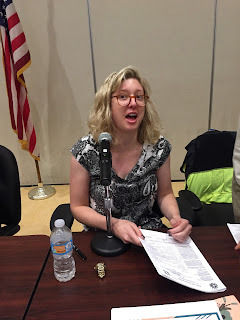 It should be noted on the four occasions since 2010 when the City Council has denied waivers, the meetings were attended by a vocal contingent of angry neighbors. Regardless, the May 1st denial begs the question: how effective is Emeryville's Noise Ordinance? How's Emeryville doing? A Tattler Public Records Request reveals a very weak law that defers to the interests of developers over residents. Emeryville blogger Rob Arias taps out tweets protesting the city's affordable housing bond from his upscale loft in one of the city’s most fashionable buildings. With it's soaring ceilings, giant windows and large shared roof deck, it’s the kind of place low- and middle-income people only dream about. Including Rob Arias. But unlike many aspiring homeowners in the Bay Area, Rob got lucky. He was able to realize his dream thanks to the city of Emeryville, which required the developer of 1500 Park Avenue to include affordable units. That's right. Rob Arias lives in the kind of moderate-income housing he now thinks is a bad idea ... for everyone else. 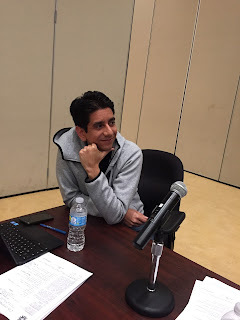 Mr Arias, a self-proclaimed community booster and family man, has been working hard for the past few weeks to crush support for the city’s proposed housing bond, designed to help families just like his afford to own a home in Emeryville. According to Mr Arias, the cost – at least to his family – is too much. But the cost to many other families who struggle with skyrocketing rents and home prices edging toward $1 million is much higher. They live in cramped apartments, work multiple jobs, and are eventually forced to move away or become homeless. According to the City of Emeryville, $83,000 in annual income is needed to rent a one-room apartment in town. "Measure C will give us tools to prevent the displacement of vulnerable people, including seniors and young families, already living in the community," said former mayor and current City Council Member Dianne Martinez. 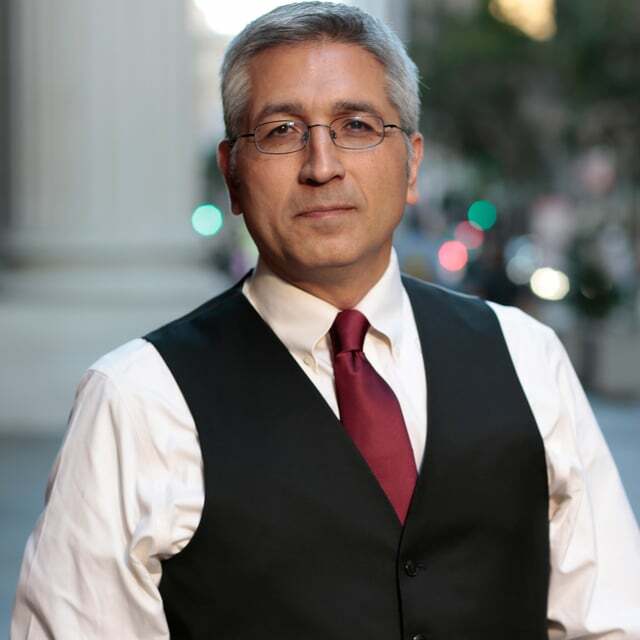 In a series of tweets and blog posts, Mr Arias erroneously argues that Measure C, an affordable housing bond on the June 5 ballot, costs too much and does too little. He says that the measure will cost each resident $4,284. He bases his estimate on an assessed home value of $300,000 even though the value of most properties in the city is well below that. Under Prop 13, the assessed value of all property in California is fixed at the time of purchase. More than half of the residents purchased their homes in Emeryville for less than $300,000. In addition, the $50 million of bond funding will generate as much as $500 million in matching state and federal grants and funds. The money will be used to build affordable housing on City owned land as well as provide low-interest loans to first time homebuyers. Emeryville Mayor John Bauters, an affordable housing expert and champion of the measure, said the funds raised would be used primarily for those already living in the city. He said residents would provide about 35 percent of the funds and businesses the remainder. He emphasized that the tax increase paid by homeowners would be based on assessed value of property, not market value. Mr Bauters declined to be interviewed for this story. "… No other jurisdiction in the East Bay has gone all out like this to raise money for affordable housing and anti-displacement programs. Measure C bonds will be paid back over 30 years through a 4.9 cents per $100 of assessed value property tax, meaning that the tax is relatively progressive and shouldn't be an undue burden on the average Emeryville resident". 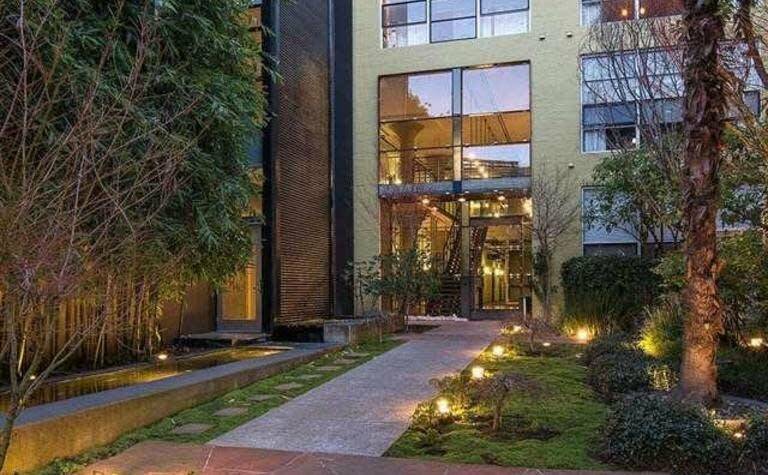 In 2003, Mr Arias applied for and got, a Below Market Rate (BMR) condominium at 1500 Park Avenue, a six-story warehouse conversion by award winning San Francisco architect David Baker. The price break given to Rob, who lives there with his wife and young child, was substantial, amounting to about $180,000 based on the price of a comparable unit sold in the building that same year. Mr Arias has consistently taken a stand against reform that helps the less fortunate, railing against an increase in the minimum wage and fair work practices for retail workers, and proposing that a homeless encampment under the 40th Street bridge be replaced with a dog park. Last Wednesday night, Emery School Board members, considering whether to consider supporting Measure C, Emeryville’s emerging June housing bond, demurred, a majority disapproving and refusing to aid citizen efforts to help bring affordable family housing to Emeryville. The Board's vote to reject affordable housing split fell along familiar lines; the 'affluent majority' made up of Corporate Vice President of Marketing Cruz Vargas, school architect Donn Merriam and lawyer Bailey Langner rejecting member Barbara Inch’s proposal to discuss the June 5th Measure C with an eye towards endorsing it. family housing will do "nothing for the greater good". discussing the housing measure by the Board. 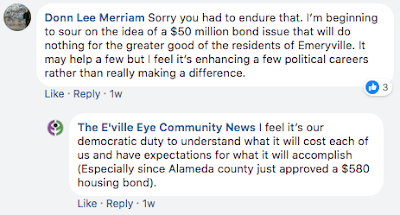 Measure C would leverage some $50 million of Emeryville bond proceeds with State and other funds ultimately providing $300-$400 million to build affordable housing for Emeryville with an emphasis on families. The lack of affordable housing has become Emeryville's most intractable problem, especially for the School District. Citizens not familiar with politics at the Emery School Board watching the proceedings last Wednesday night, might have been surprised a school board would reject an affordable housing measure that places families with children attending Emery’s schools at the top of the list for housing placement. Even some veteran Board watchers expressed bewilderment at the Board’s own gas lighting policies. Let the private sector work it out. low income or middle class families. The housing crisis that has befallen Emeryville comes on the heels of a 20 year private sector building boom that’s almost doubled the population and caused a shift from a town of majority home ownership into an unaffordable renter majority town. The results are dramatic; the annual income needed to afford a studio apartment at this point in Emeryville is a shocking $83,772 according to City records. Not surprisingly, the effects have hit families hardest; Emeryville already has the fewest families of any town in the East Bay and the private sector is failing to deliver affordability for them in the housing market. The explosion in rents has chased out middle class and low income residents, especially families with children and fueled a crisis at Emery where attracting students is only possible by inter-district transfers. Further, the District, struggling to survive, has turned its focus away from the business of educating children and embraced a new role as a real estate enterprise; renting out its two closed schools to shore up its budget in the face of the declining student enrollment. The low numbers have driven the District's budget into deficit even with the real estate deal making. Emery historically has been interested in increasing student enrollment despite the Board’s inexplicable decision Wednesday. In 2010, the District sold Emeryville voters on the idea that the building of the new school campus, the Emeryville Center of 'Community' Life (ECCL), would generate a large increase in students, a $95 million gambit that has failed to deliver any increase in enrollment. Years later, the District continues to suffer from low enrollment, driving up the cost per student and turning Emery into the most expensive district in the East Bay, now pegged in excess of $14,000 per student per year. Interestingly, the same Board members that now can't imagine monies being spent on affordable housing in Emeryville just last month had no problem supporting a renewal of Measure A, a School District proposed sales tax that spends money outside Emeryville, including at one of the private schools that has a sweetheart deal with the District. The problems the District faces with low student enrollment and its corollary of providing a place for families to live in Emeryville were not considered by the Board Wednesday night however; the majority seeing to it there should be no government action in response to what a rapacious private sector has delivered to us. Emeryville voters will go the polls June 5th regardless of the School Board’s precipitous and inexplicable NO on affordable family housing. Board President Vargas didn't return calls for this story and member Merriam, running for re-election in the fall, refused comment, allowing his "greater good" statement made to the E'Ville Eye blog to stand. Correction: We originally reported Measure A as an existing parcel tax. School District insiders inform us in fact it is a proposed sales tax. We apologize for the mistake. cracked up to be. Who needs more families in Emeryville? Eight teachers are not returning to Emery in the fall according to recently released School District documents, marking a continuation of a four year trend of disruptive teacher churn that has earned the little district the dubious and ongoing distinction of having the worst teacher retention problem in the Bay Area. The teacher exodus is accredited to outgoing superintendent John Rubio who has claimed responsibility as part of a self described scorched earth program of jettisoning what he has characterized as the “dead wood” of bad teachers. The eight certified teachers driven out so far this year represent 20% of the entire teaching staff at Emery, an improvement over last year’s epic 37% teacher loss but still far higher than any other district in the Bay Area. Critics of the Superintendent’s policies point out the fallacy of his claim he is merely firing bad teachers by noting the teachers he is now driving out (or firing) are the same ones he himself hired, a point conceded by an Emery teacher who told the Tattler recently, “He’s getting rid of the teachers he hired.” The teacher, who wished to remain anonymous out of fear of losing his/her job, added that after four years at it (representing Mr Rubio’s entire tenure at Emery) almost every teacher left at this point is one he himself has hired. 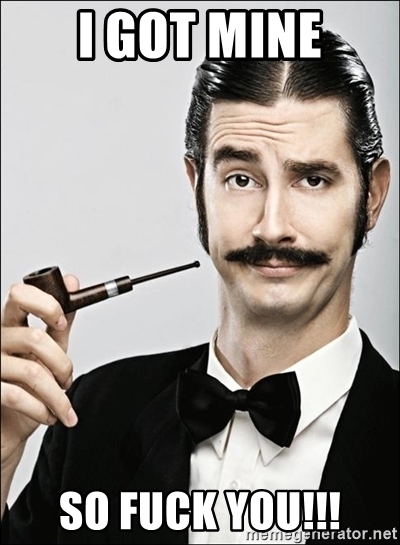 The results for Emery have been failure. For his part, Mr Rubio has thus far refused accountability for ill effects visited upon Emery as a result of the massive and disruptive teacher loss the District has been subjected to, effects universally recognized by educational professionals it should be noted, lashing out instead against his critics including the Tattler who has documented the teacher loss associated with his policies. Educators commonly cite teacher retention as the single most important metric for measuring the efficacy of a school superintendent and also a school district. Studies have shown districts with high teacher retention as being the best predictor for high academic progress regardless of student demographics. Mr Rubio’s oft repeated assertion that the opposite is true; namely that the lower the teacher retention, the higher the academic performance, at least at Emery under his tutelage, is not indicated by the evidence; not at Emery or anywhere else in the world. In fact, Emery’s academic standing has been markedly degraded since the implementation of Mr Rubio’s slash and burn teacher retention policies marked beginning in his first year at Emery. Lots of Bad Teachers at Emery? Superintendent Rubio has often said the poor teacher retention numbers he has garnered at Emery are really a feature rather than a bug. He states unequivocally that the academicians are wrong and he's right: low retention rates are a sign of a bold superintendent setting things right. Besides testing people's skeptical nature with his claim, Mr Rubio's postulate assumes a strange and unquantified inability for Emery to attract quality teachers in the first place. Implicit in his assertion is the notion that bad teachers really love Emery. Somehow, other school districts can attract good teachers but Emery only seems to get the bad ones. How else to explain the Superintendent’s astounding record of his firing and driving out teachers only to have to keep at it year after year with his own hires continually heading for the exits? 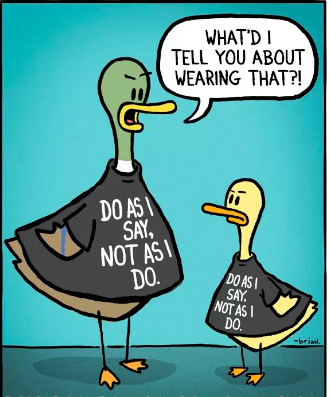 In education, perhaps more than any other field, evidence-based policy has been the standard as opposed to whatever capricious policy has been coming from Mr Rubio, a man heretofore interested in keeping his employment at Emery. As we search for a new superintendent, Emery should try experimenting with what education academicians and sucsessful school districts around the world have for decades found to be true and leave the teacher purging experimenters for another district. Eight teachers quit or forced out, two retired and one councilor quit.